ACCTA, Inc. provided assistance in selection of appropriate equipment. Then we helped train the staff to use both the software and hardware. Finally, we coordinated method development and method validation. An efficient method was developed to provide the necessary sensitivity and selectivity. 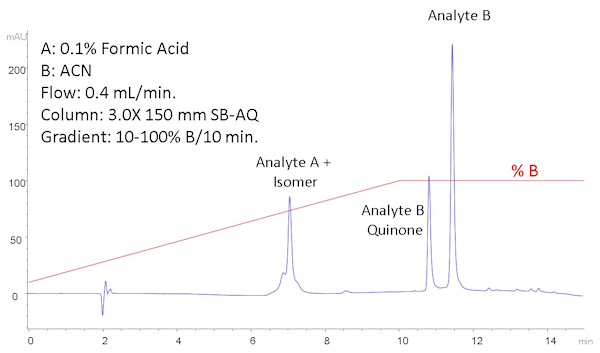 As shown in the chromatogram below, analysis was complete in 15 minutes. We were able to easily separate one related impurity and partially separate an isomer of the other analyte (better separation was possible but not needed for this application, since only the total amount was of interest). The solution preparation procedures and mobile phase were much simpler than the corresponding USP methods. The polar embedded phase provided better selectivity and retention than a standard reverse phase column, and since we used a smaller bore column, we were able reduce solvent consumption by 60 %, compared to a standard column. The procedure could also be used with an LC-MS system.